After being involved in the commercial development at Promethera for one year we are happy to announce that Henrik Luessen has been appointed as Chief Business Officer of the company. Atriva Therapeutics GmbH announces the successful first closing of its first financing round to develop its antiviral therapeutics platform based on MEK Kinase inhibitors. The company was founded in 2015 by the inventors of the underlying patents and further experts with medical and commercial backgrounds in the industry. Henrik Luessen and Tytonis have been part of the original founder team from the beginning. DendroPharm has been nominated for the innovation award ("Innovationspreis") for its nanocarrier product DendroSol® by the German state Berlin-Brandenburg. The Innovation Award Berlin-Brandenburg is one of the most prestigious awards for novel products and is awarded annually. 120 innovative products by large, small and medium enterprises have entered the competition in 2016. Of those 10 innovations have been nominated. DendroPharm GmbH develops nanocarriers which enable a highly efficient transdermal drug transfer for both lipiphilic and hydrophilic compounds. DendroSol® nanocarriers are non-toxic, biodegradable and do not irritate the skin. This results in significantly reduced side effects. The technology has been developed together with Prof. Rainer Haag from the Free University in Berlin. It enables patients to switch their daily medication from oral to transdermal and thus prevent gastrological side effects. DendroPharm is through Tytonis Operations GmbH also actively supported by Tytonis. EcoRaxx GmbH (Essen, Germany) has been registered on March 10, 2016. The company develops a new generation of rodenticides that overcome the disadvantages of the current established products in terms of environmental safety, avoidance of growing resistance and the potential to achieve higher species selectivity in order to spare the non-rodent fauna. On March 13, 2014, Activaero GmbH (Gemünden, Germany) announced that it has reached agreement with Vectura Group plc (Chippenham, UK) to be acquired for a transaction price of 130 Mill Euros. Activaero has evolved to become the key player in patient controlled inhaltion (FAVORITE™, meaning Flow And VOlume Regulated Inhalation TEchnology) and a provider of advanced medications utilizing their FAVORITE™ technology (FAVOLIR™ and SCIPE). Tytonis has been working since the past 8 years with Activaero in different subjects, like product/portfolio strategy, business development and valuation topics. Dr. Henrik Luessen had the opportunity to act as their interim CBO until 2012. The Tytonis team congratulate the founder and CEO of Activaero, Dr. Gerhard Scheuch and his team for their achievements! On February 3, 2014, Nanomi BV announced that it has reached agreement with Lupin to be acquired and will remain a center of excellence within Lupin for the development of injectable depot products using their proprietary MicroSieve Emulsification™ technology. Tytonis has been working since 6 years with Nanomi BV in different subjects, like product strategy and development of their depot products (partly supported by the Dutch grant NanoNextNL), business development and vauation topics. We congratulate the founder and CEO of Nanomi, Dr. Gert Veldhuis and its team with their achievements and think that this transaction underlines the importance of cost-efficient and safe process technologies for the new generation of injectable depot microspheres. 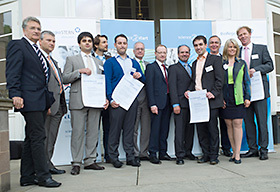 The business idea developed by three highly recognized university groups headed by Stefan Ludwig (Universität Münster), Oliver Planz (Eberhard-Karls-Universität Tübingen) and Stephan Pleschka (Universität Giessen) has been awarded with the first price by the BioRegio STERN Science2Start competition. Besides the inventor team (Ludwig, Planz, Pleschka) also Emilie Hofstetter from HealthStrat Consulting (Munich), Rolf Naumann (Gemünden) and Henrik Luessen (Tytonis BV, Alkmaar, The Netherlands) belong to the awardees. The inventor team is developing a novel medication against seasonal flu by combining co-called MEK inhibitors with neuroamidase inhibitors. In particular, Tamiflu™ efficacy has been enhanced even when the virus had developed a certain degree of resistance against Tamiflu™. The team is now preparing to found the company to undertake the necessary steps to commercialize the product technology. The awardees of the BioRegio Stern competition. Far right: Prof Dr. Oliver Planz (Eberhard-Karls-Universität Tübingen). 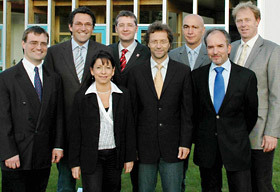 3rd person from the right: Rolf Naumann, Gemünden. 5th person from the right: Prof. Dr. Stephan Pleschka (Universität Giessen). Xenikos announces the establishment of its Supervisory Board. We are delighted to publish that Henrik Luessen of Tytonis BV has been appointed as a member of the Supervisory Board, together with Jaap Kampinga, M.D., who is acting as the Chairman of the Board and Theo Bunnen, Ph.D. We are looking forward to support Xenikos to bring its lead product successfully to patients with severe acute Graft vs Host Disease. We are happy to announce that Xenikos BV receives 5.5 Mill Euro funding to advance its clinical development of their T-Guard™ product for the Orphan indication GVHD (graft versus Host Disease). The funding is provided by Xenikos strategic partner Sanquin Blood Supply Foundation, the regional development fund PPM Oost and the Innovation and Investment Fund Gelderland. As part of the funding, Agentschap Nederland agreed to support the clinical development with an innovation credit of 1.9 Mill Euros. T-Guard™ consists of two toxin-loaded antibodies that by targeting primarily adult and over-activated T-cells allow the body to restore its immunbalance. Tytonis supported Xenikos and Sanquin during the commercial diligence evaluation. On January 17, 2012, the acquisition of Symbiotec GmbH (Saarbrücken, Germany) by Xenetics BioSciences PLC (London, UK – see also news feed) was completed and Symbiotec has become a fully owned subsidiary of Xenetics. Clinical trials in Non-Hodgins-Lymphoma patients with OncoHIST™ have been initiated in the meantime. Tytonis has supported the acquisition process as the commercial diligence partner to both Symbiotec and Xenetics. For further questions and contact concerning OncoHIST™, please visit the Xenetics website. Furthermore, you can find additional information in the recent release of ACQ Magazine. Xenikos and Tytonis announce their partnership to find suitable financial partners and licensees for their T-Guard product. T-Guard addresses immunological disorders caused by deregulated T-cells. Their product has successfully completed an investigational clinical trial in severe acute Graft versus Host Disease patients with clear signs of efficacy. Interestingly no severe drug-related adverse events have been found in the study. T-Guard has also received Orphan designation by the EMEA and is furthermore protected by patents until 2023. It should also be noted that the product may have further upsite potential in other immunological disorders caused by deregulated T-cells. More information can be found on the non-confidential factsheet provided for download on this website. This product is also recognized as a highly ethical product and fully supported by the independent Pharma@Work network team. InSCREENeX GmbH, a start-up company that develops and commercializes novel cellular screening technologies, today announces the appointment of Dr. Henrik L. Luessen to the position of Chief Business Officer. He will be responsible for business and strategic development with a particular focus on launching the company's innovative SCREENflex™ and CI-SCREEN™ technologies which can significantly improve biopharmaceutical drug discovery and validation. Besides InSCREENeX, Henrik Luessen will keep his position as Managing Director of Tytonis and his earlier reported appointment as Chief Business Officer of Activaero GmbH. Tytonis is happy to announce the release of the book »Protein Pharmaceuticals – Formulation, Analytics and Delivery«. This book has been co-authored by more than 30 internationally recognized experts in the field of pharmaceutical protein formulation providing the most state-of-the-art information. This book is considered to be highly valuable for anyone active in the development of protein pharmaceuticals. As of today, Activaero GmbH, the leading company in the field of controlled breathing technologies for inhaled therapeutic agents has appointed Henrik Luessen as their Chief Business Officer. He will be hired in for fifty percent of his available time and keep his position as Managing Director at Tytonis BV for the rest of the time. Henrik Luessen will support the Management Team with focus on corporate and business development activities. Tytonis proudly announces a new partnership with SymbioTec, Saarbrucken, Germany. Under this partnership Tytonis will support SymbioTec with the commercialization of a novel oncolytic protein, called ONCOHIST™. The compound is based on a member of the endogenous histone family and has shown in toxicological and clinical studies (phase Ib/IIa) that it is safe, non-immunogenic and well-tolerated. It has shown in comparison with other therapeutic cytotoxic compounds to be at least as potent when tested with a multitude of human cancer cell lines in-vitro. The efficacy has also been found back in animal studies and a dose-finding clinical trial with 22 AML (leukemia) patients. More information of this highly attractive compound can be found on the non-confidential fact sheet provided for download on this website. This product has also received Orphan designation in Europe and based on its high ethical potential is furthermore fully supported by the Pharma at Work expert network. Tytonis BV is proud to announce the recent execution of an option and license agreement between Activaero GmbH and Bayer Healthcare AG. Tytonis was representing Activaero during the business strategy, valuation and negotiation of this business transaction. The Activaero team involved in the license transaction with Bayer. From left to right: Dr. Henrik Luessen (Tytonis BV), Prof Stephan Ludwig (University of Münster), Ann-Kathrin Klink (Legal counsel), Axel Fischer, Gerhard Scheuch, Rolf Naumann (all three Activaero GmbH), Prof Stephan Pleschka (University of Giessen), and Prof Oliver Planz (Friedrich-Loeffler-Institute Tübingen). Tytonis BV is delighted to announce its active support in Nanomi's strategic corporate planning process and ongoing business development activities. Sterna Biologicals, a company represented by Tytonis BV in its up-coming financing round, has won second place in Germany's prestigious »Science4Life« Business Plan competition. The business plan was made in close co-operation with Tytonis and its network partners Apis Pharma and TransformRx.